When you’re invited to a business to shop or for entertainment, the business owes a duty to exercise reasonable care to protect you from a slip and fall or other injuries that could be prevented by proper maintenance and repair. Slippery floors, bad stairs and broken chairs aren’t your fault when you are invited to someone’s place of business. 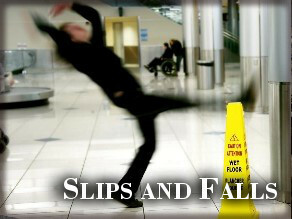 If you slip and fall because of their negligence, you may be entitled to compensation. If you’ve been injured by a slip and fall or other injury on someone else’s property, and want to find out if you are entitled to damages for your medical costs, contact the Tulsa slip and fall attorney Wirth Law Office today to find out if you are entitled to compensation. Contact the Wirth Law Office at (918) 879-1681. Oklahoma premise liability law relies heavily on common law principles that provide varying degrees of liability depending on whether an injured person is invited for commercial purposes (an invitee), for social purposes (a licensee) or for purposes of their own without an expressed or implied invitation (a trespasser). A social guest, or licensee, injured on someone else’s property can also be entitled to damages, but property owners duties to them are somewhat less than a property owners duty to customers invited for commercial reasons. The property owner or one who allows social guests into their property has a duty to warn guests of dangers they can’t easily see. Because premise liability law in Oklahoma tends to favor property owners, the services of an Oklahoma premise liability attorney can be helpful if you’ve been injured on someone else’s property. An Oklahoma tort reform bill signed into law in 2004 provide owners a defense against premise liability cases charging ordinary negligence when the plaintiff was not authorized to be on the property. And while some states carve out special protection for children who wander onto property without an owners permission, Oklahoma laws are somewhat vague on the subject of children and premise liability. Nonetheless, where gross negligence can be proven or where “wanton or malicious acts of negligence” result in injury to a person or a child, they injured person may be entitled to compensation. That means if a person was “conscious of the risk or had specific reason to know about it, and proceeded without concern for the safety of others” they may be liable to compensate a person injured as a result even if the person was not on the property as an “invitee” or “licensee.” Even when a person is trespassing, the law generally recognizes the duty of property owners not to use excessive force in defending the property or those authorized to be on the property. If you would like a free consultation with an Tulsa premise liability attorney, call the Wirth Law Office at (918) 879-1681 (or toll free at (888) Wirth-Law) or submit the question form at the top right of this page.